Based on feedback we have received from members of the general public, the museum embarked on a significant renovation of the ground floor gallery. The theme of the gallery remains Roman; however there is more of an emphasis on telling the story of Roman Chichester and District in a more effective and clear way, as well as improving the interpretation of the archaeological remains of the Roman bathhouse. 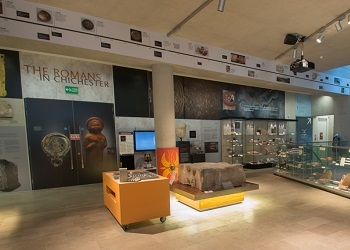 The exhibition includes the mounting of two fragments of mosaic on the wall next to the Chilgrove mosaic and the display of objects from excavations in the city centre which have never before been on display. The exhibition was officially opened by Lady March on Wednesday, 17 August 2016.